In January 2015, Associate Professor of English Dr. Edyta Oczkowicz traveled to Columbus, MS, to present a keynote lecture for the Big Read Program. The Columbus Arts Council organized the program, which is part of a National Endowment of the Arts initiative that aims to restore reading to the center of American culture through community-wide reading programs across the nation. 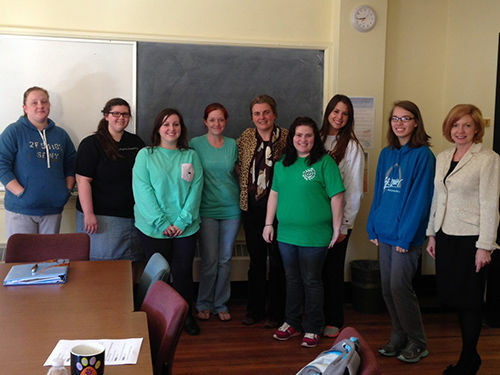 Oczkowicz’s lecture, Thornton Wilder as a Young Artist, was delivered at Mississippi University for Women, where she was also a guest speaker for an English senior seminar class. While in Columbus, Oczkowicz spoke to the Columbus Community Theater cast of Our Town, a Thornton Wilder play they will produce in March. Her trip to Columbus was preceded by a fall 2014 project, in which Oczkowicz edited the ninth volume of the Thornton Wilder Society Newsletter. The issue celebrated Wilder’s induction to the Chicago Literary Hall of Fame and was authored by late Salem College friend and longtime writer-in-residence Penelope Niven.